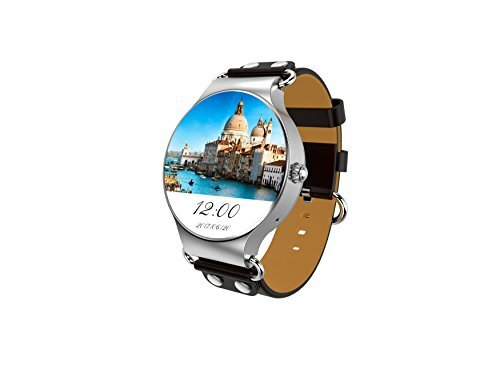 High Screen Resolution - This smart watch has a screen with 400 x 400 pixel resolution which will give you a sharper and super clear display. Multiple Functions - With the Bluetooth 4.0+WIFI, GPS, SIM CARD support and other usual functions, this watch will satisfy all your daily needs. Super Intelligent - Android 5.1 operating system, high compatible with Android system and IOS system. This smart watch is super intelligent as a health, fitness sensor with pedometer, distance counter, calorie counter, sleep monitoring. Fine Workmanship - Focused on every detail, with the delicate design and smooth lines, this watch will be your one of favorite wear decorations. Fashionable Design - With the intelligent, concise and fashionable screen display, this smart watch is combined with classical elements and modern technology, which will highlight your taste.